<EM>Advances in Asymmetric Synthesis</EM> presents content from pioneers and authorities in this rapidly expanding field. Enantioselective synthetic methods are not only in the forefront of chemical and pharmaceutical research but activity in this area is constantly increasing. It is stimulated by the urgency to obtain drugs or compounds of medicinal interest as single anantiomers, and the keeness to synthesize natural products in nonracemic form. 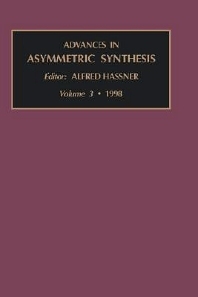 For scientists and researchers in the field of asymmetric synthesis. Enantioselective synthetic methods are not only in the forefront of chemical and pharmaceutical research but activity in this area is constantly increasing. It is stimulated by the urgency to obtain drugs or compounds of medicinal interest as single anantiomers, and the keeness to synthesize natural products in nonracemic form. This volume presents seven chapters from pioneers and authorities in this rapidly expanding field.